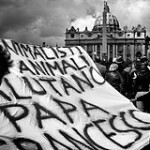 47/365 – “Habemus Papam” nr.19, a photo by Luca Rossini on Flickr. 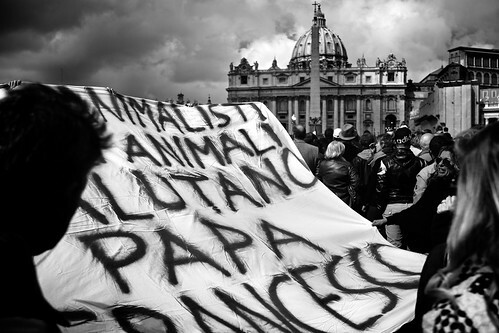 “Animals greet you, Pope Francesco”. The new Pope keeps working as an attractor of renewing (if not revolutionary) forces, and Saint Peter’s square as the stage where these forces have a chance to be broadcasted worldwide. This time I bumped into a group of animal-right activists, trying to draw some attention to the animal rights and, more specifically, to the “slaughter” of 800.000 (as evaluated by the organization Animal Equality) lambs for the typical Italian lunch of Easter. There was no violence or anger in the words the activists put on their banner, nor in the way they raised it towards Saint Peter a few seconds after I took this shot. Pope Francesco seems to be viewed by these renewing forces as a natural ally more than as the symbol of cultural conservatism, as the Catholic church is usually depicted. It is a huge change of paradigm, one which nobody can say how long will last but everybody can’t help but hope it will be long enough for things to get better. That said, for the Easter Mass celebrated by Pope Francesco in Saint Peter’s square more than two thousand and five hundred people gathered. For the first time since I started the “Habemus Papam”, I saw the police stopping people from entering in the area around Saint Peter’s because those inside were already too many. So, two thousand five hundred managed to get in the square, under the arcades, around the square, or all along via della Conciliazione, but I don’t know how many were the ones who couldn’t even get there.